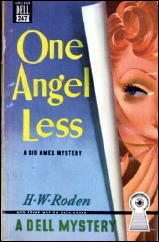 » Reviewed by William F. Deeck: H. W. RODEN – One Angel Less. Reviewed by William F. Deeck: H. W. RODEN – One Angel Less. H. W. RODEN – One Angel Less. William Morrow & Co., hardcover, 1945. Detective Book Club, hardcover reprint, 3-in-1 edition, June 1945. Dell 247, mapback edition, 1948. Sid Ames, private Investigator, is hired to check up on a woman who is in a private hospital. Her husband is not allowed to visit her and wants to know what is going on. For the best of motives — he needs the money — Sid agrees to investigate even though he loathes small towns, in one of which this hospital is located. And he has good reason to dislike this small town since its officials turn out to be corrupt. One Angel Less is the standard tough-guy novel, with the females getting in each other’s way while they try to get at Sid. He is beaten up and yet awakes the next morning in surprisingly good condition. He undergoes another beating along with dehydration during an interrogation at the police station but escapes shortly thereafter by leaping out a window and running pell mell. Oddly, a display of coffins outside his hotel gives him the willies. For those who don’t mind novels the last chapter of which the villain has the drop on our hero and reveals all, omitting no detail however slight, and then is shot dead by our hero, who can barely use the hand holding the gun, surprising no one but the bad guy. Talky villains always come to no good end. Editorial Comment: Bill’s review of You Only Hang Once, another mystery by H. W. Roden, was posted earlier on this blog. Check it out here. (He didn’t much care for that one, either.) Private eye Sid Ames appeared in a total of four novels. A complete list follows the previous review. I don’t think anyone likes these books. I have tried to sell two copies of Roden’s books for years and no takers. Ever. After reading this I won’t even try one. Life is too short. But those Roden mapbacks are indeed attractive. As I said in the comments following Bill’s review of another Sid Ames book, I’ve read one, or started to. I don’t remember which one or even whether I finished it or not — which is hardly a recommendation, is it? But the covers on the Dell mapbacks are very nice, making them collectible in that respect (assuming that mystery readers today even know what mapbacks are). The books were published by William Morrow, a major publisher (i.e., Perry Mason), and were picked up to be reprinted by the Detective Book Club. So in their era, Roden’s books were widely available — and I’m assuming that means widely read — but from all reports, all four are only generic tough guy stuff, nothing more. Prime examples of forgotten books, and as you say, John, tough sells today. Contrary opinions always welcome, of course! Late last year, I was able to put my greedy hands on an omnibus edition that collected the following novels: Anne Rowe’s TOO MUCH POISON, George Sanders’ CRIME ON MY HANDS and H.W. Roden’s TOO BUSY TO DIE – and inquired with the GAD group if the latter was any good. The group always has one or more members who can tell you a thing or two about the most obscure writers imaginable, but the silence I got in response was deafening and Roden is not that unheard of that this group of experts had nothing to say about it. So I had this foreboding feeling that he might be one of those bad writers and shoved him down the pile. But after reading this review and John’s comment, I wonder if I’ll ever get around to reading it. I’d like to be more positive about it, but all in all, until someone should say otherwise, I’m inclined to go with the majority opinion so far. By the way, TomCat, that omnibus edition you have, three novels in one, is the Detective Book Club selection for June 1945. DBC volumes used to be extremely common in used bookstores, and were a great way to find old out-of-print detective fiction to read. But alas neither they nor used bookstores are as common as they used to be. I think all Roden’s books are fun reads.They’re told with a sense of humor. No they’re not masterpieces but every once in a while I’ll grab one and read it again. Were any of his books made into a movie? I enjoy all Roden’s books. Thanks for the comment, Joe. In spite of the so-so to rather negative reaction so far, it’s good to know that Roden still has some fans. No, none of his books were made into a film, and that’ too bad. I think the could have made into films as good as or better than the general run of detective B-movies made back then in the mid- to late 40s.